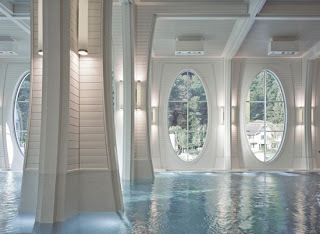 This view of the Tamina Therme spa in Bad Ragaz, Switzerland is so uplifting for me; I'm posting it simply for inspirational purposes. The quirky mix of modern and historical design ingredients gives the space a cool freshness; the light is clear and the water—ice blue, but its source is a hot spring—is calming. The architects of the space are Smolenicky and Partner, whose website seems disabled.